Seabirds are elusive and mysterious to most birders because they are vastly different from more familiar songbirds and common backyard birds. But what makes a seabird a seabird? Understanding the special traits of these birds can help birders appreciate them even more. Because of seabirds, by definition, spend most of their lives far out to sea, they are difficult to study and less is known about them than more familiar types of birds. There are many different seabirds from auks to gannets to penguins. Still other categories of similar species, such as cormorants, terns, pelicans, and gulls, are often categorized with seabirds even though they are not true marine birds. Despite the great variety of seabirds, however, each of these species shares common characteristics that define them as seabirds. 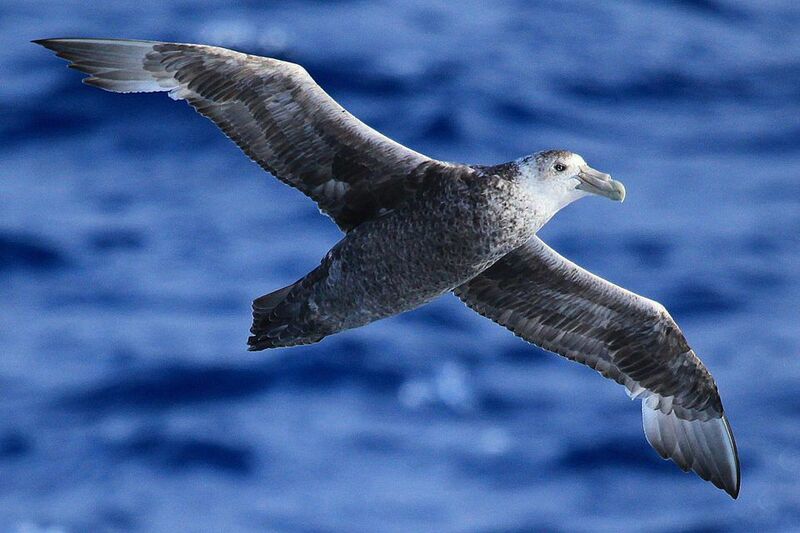 Seabirds can be found worldwide with varying ranges through waters of different temperatures, but what is true about all their ranges is that they are pelagic: They roam far out to sea rather than staying exclusively near coastal areas or islands. Seabirds can, in fact, be found hundreds or thousands of miles from the nearest land, and many seabird species may spend years at sea without ever returning to land. When they do visit islands or coastlines, it is often just to breed and raise their young, a process which may take a few weeks or several months. Outside of breeding, seabirds spend most of their lives above, on, or in the sea. Seabirds are well adapted to life in a marine environment, and they have several physical adaptations that give them an advantage for life on the high seas. Knowing these adaptations can help birders instantly recognize if they are looking at a seabird. Plumage Coloration: Most seabirds have drab plumage that is dark above and light below. This type of coloration, called countershading, offers camouflage from aerial predators and hides the bird from potential prey beneath them. Feathers: Seabirds have more feathers relative to their body size than other birds, which gives them superior waterproofing and insulation. Some seabird species have even more specialized feathers to help with buoyancy or additional insulation, such as penguins' dense feathers that protect them from Antarctic temperatures. Feet: Most seabirds have flexible webbed feet that help them be powerful swimmers or help propel them across the water to gain speed for takeoff. Some species have strong claws on their feet to help with fishing as well. Wing Shape: Seabirds' wings are specially shaped for their unique flight needs. Longer, more tapered wings allow seabirds to soar for hours with very little effort, allowing them to remain aloft far from land. In some species, shorter wings give the birds better control and agility for flight right at the surface of the water. Salt Glands: Many seabirds have specialized salt glands that extract salt from the birds' food and water, allowing them to eat and drink without dehydration from too much salt. Excess salt is then excreted, typically near the birds' nostrils. Head Structure: Seabirds that hunt deeper in the water through plunge diving, such as gannets, have specialized adaptations in their head structure to withstand high-speed impacts with the water. Strong, tapered bills, air sacs, and thicker bones protect these birds from injuring themselves as they hunt. Because of their unique environment, seabirds act uniquely. Understanding the behaviors of seabirds can help birders appreciate these marine birds and their unusual niche in the world's avifauna. Diet: Because of where they live, seabirds subsist on a diet of primarily fish, squid, and crustaceans. Many seabirds will mob fishing boats in search of easy food from discarded fish and offal, and seabirds have also been known to forage through trash dumped at sea. Flight: Most seabirds are powerful fliers with the ability to soar without effort on their long wings. The gliding, soaring flight of seabirds can be easily recognized, though smaller types of seabirds do have more energetic and erratic flight patterns. Breeding: Unlike the solitary breeding preferences of many bird species, seabirds are colonial nesters and a breeding colony may grow to thousands of birds. Most seabirds nurture their young for much longer than typical land birds, and it is not unusual for a seabird fledgling to remain with its parents for several months at sea. Because of this long parental care period, most seabirds raise only one brood per year, and that brood is often just a single egg. Lifespan: While a typical songbird may live just a handful of years and a bird older than 10 is unusual, seabirds have much longer lifespans. Many seabirds do not fully mature until they are several years old, and a lifespan of 20-40 years is not uncommon. Seabirds are unique and distinctive, with both physical and behavioral adaptations that help them survive in their marine environment. By understanding what makes a seabird a seabird, birders can enjoy and appreciate any of these unusual birds they see.